Independent science fiction film Ex Machina is the most inexpensive film to ever win an Academy Award for Best Visual Effects, which makes it an obvious choice for a 4K upgrade, despite the simplicity of the narrative. 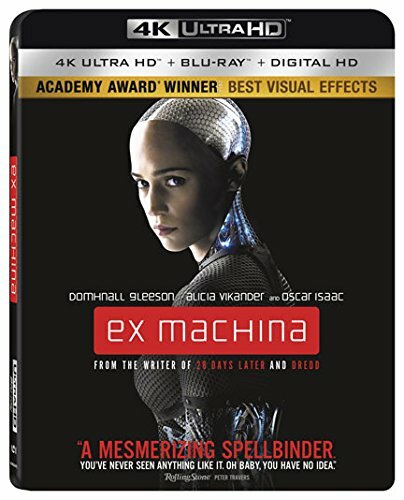 Even with the accolades, Ex Machina is a thoughtful film focused on the characters and overall themes rather than moments of special effects. The effects are secondary, though there is no denying the visual enhancement of Ultra HD makes it all the more easy to become immersed in the story. The basic premise of Ex Machina is far from original, however expertly it is done. Our protagonist is a programmer named Caleb Smith (Domhnall Gleeson) who has been chosen to visit the CEO of his company, Nathan (Oscar Isaac), in his remote mountain estate. Once he arrives, Caleb discovers that he has been chosen to participate in a series of tests studying artificial intelligence that Nathan has created. Although Nathan has several robots that he has created as the only company in his secluded home, the primary focus of the study is a cyborg named Ava (Alicia Vikander). Her artificial intelligence is so convincing that Caleb begins to question the morality of keeping her locked up. Despite involving robots, there are no major explosions or high octane action sequences in Ex Machina. More than anything else, the film plays like a psychological thriller with the themes of a modern day Frankenstein. We spend a majority of the film diving into the artificial mind of Ava alongside Caleb, who begins to suspect that there is a bit of mad scientist in Nathan and his experiments. These aren’t new themes for science fiction films (in fact, they have been heavily excavated for HBO’s “Westworld”), but still manage to come off fresh by the twists and turns of the narrative and successfully committed performances from the small cast. Even though this may not be my first choice for a film to own on 4K, the wide depth of colors makes the visuals even more impressive. This is simply a well made film, and if you are going to own it, why not own the best possible version. The special features have not been changed at all from the Blu-ray release, because the 4K disc doesn’t actually have any extras. Thankfully, the package does come with a Blu-ray copy with the previously released 5-part featurette and 8 behind-the-scenes vignettes. There is also a Q&A with the cast and crew from SXSW. A digital HD copy is also included.